The 2013 Word Figure Ice Skating Championship is now over – Kim Yuna (KOR) Carolina Kostner (ITA!) Asada Mao (JPN) on the podium. Watching the competition on TV reminded me of an interesting post I saw years ago on this blog. 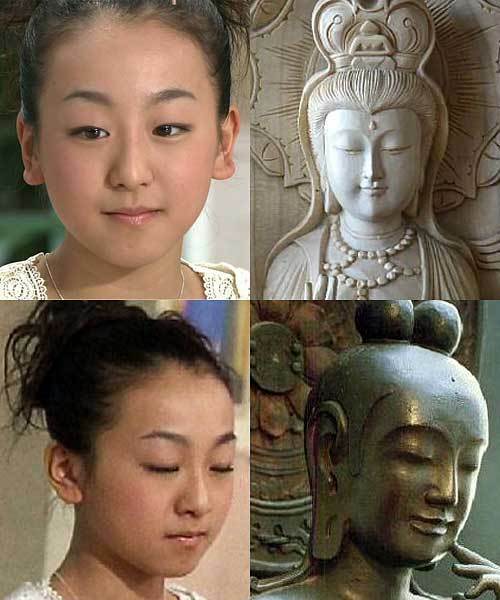 It is an interesting comparison, probably produced by some ice skating idol fan, between the faces of Kim Yuna and Asada Mao, and those of Noh masks and Buddha statues. Have a look. 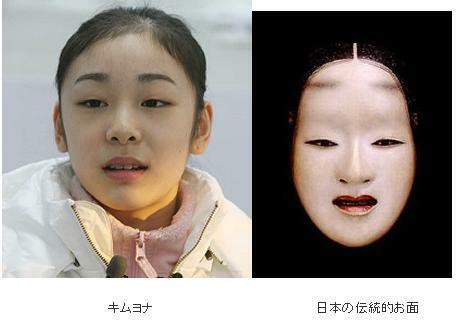 Kim Yuna is compared to the Noh mask Zo-onna, used for roles of goddesses or celestial beings, such as the Tennyo in Hagoromo. Though I think Zo-onna is a more mature face than Kim Yuna at the time of this shot (probably some 5-6 years ago) there are some interesting similarities between the two. This can only prove one thing: Kim Yuna is gorgeous. Asada Mao, instead, is compared to two sculptures of Bodhisattva, supernatural beings that decide to renounce to becoming ‘full Buddha’ and stay in ‘this world’ in order to help mankind reach enlightenment. I am not sure about the first picture, but I like the comparison with one of my favourite representations of Miroku Bosatsu (the Bodhisattva of the Future), sitting with a foot resting on the knee, the hand close to his face, with the index delicately touching the cheek. The childish face of young Asada Mao, with a high eyebrow arc resembles to that of this meditating Miroku Bosatsu, though I think it is too childish to be compared to the otherworldly face of a Bodhisattva. I tried but failed to find the source of the pictures (they seem to have spread over so many websites that I can’t find the original).